Do you want to enjoy your best birdwatching year ever? #My200BirdYear is Bird Watching’s challenge for birders of all ages and abilities, encouraging you to see 200 species in the course of 2017. They can be anything from the birds you see on your back garden feeders, to seabirds passing offshore as you relax on the beach. There are no restrictions on where you do your birdwatching, and you won’t have to wait for your ticks to be approved by a committee – it’s all about enjoying new birds, and learning more about the wildlife all around us. 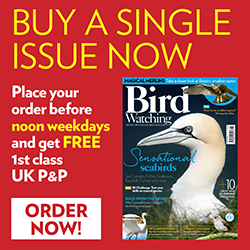 Here at Britain’s best-selling birdwatching magazine, we want to inspire you to get out and watching birds, whether it’s on a half-hour stroll during your lunch hour, or a week-long trip to an avian hotspot. We’ll provide motivation, expert advice, and an online community to celebrate your milestones, your best days of birding, and your most memorable sightings, plus free content and goodies from our partners. In the magazine, we’ll show you how dozens of species that have eluded you in the past are within easy reach, by mastering basic ID skills and fieldcraft, by being in the right place at the right time, and by taking the chance to watch birds whenever you can. Sign up here now to get updates, exclusive content, competitions and discounts, plus the chance to go birdwatching with members of the Bird Watching team at key locations. Get ready to enjoy a life-changing year – one bird at a time!